It is obvious that Sooraj Barjatya is caught in a time warp. His latest offering after a hiatus, despite being a tale set in present times, looks and sounds exactly like a period extravaganza, courtesy its old-fashioned and melodramatic, at times even regressive, treatment. Sure, the sets are visually opulent but the absence of a credible screenplay only serves to highlight the hollowness of the grandeur. It is left to the crowd-puller Salman Khan, seen here in two avatars, to give the lacklustre script the occasional shove and push. He plays Prem Dilwale, the star attraction in a Ram Leela troupe, who finds himself in the loveless world of the royals of Pritampur, a small principality that is getting ready for an elaborate coronation of the ruler, a sad and lonely prince named Vijay (also Salman). It is not long before Prem teaches the bickering regals, including Vijay’s scheming step brother (Neil Nitin Mukesh) and his two half-sisters, a thing or two about family bonding. 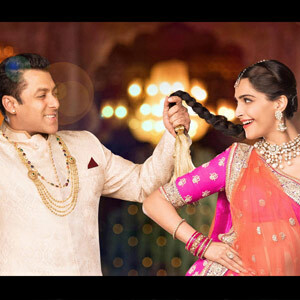 And yes, Prem also falls in love with Vijay’s beautiful bride-to-be, princess Maithili (Sonam Kapoor). The story, by the way, bears a striking resemblance to Anthony Hope’s The Prisoner of Zenda. Salman is his usual entertaining self but it does seem at times that he is trying too hard. Sonam is sweet and adequate, and together Salman and she make a pretty interesting pair! Swara Bhaskar as one of the half-sisters, manages to make her presence felt despite being saddled with silly lines. Neil Nitin Mukesh, after an imposing entry scene, has little to do. The music, except the title track, is nothing to hum about. Painfully, the narrative is laced with too many songs. To sum up, Prem Ratan... has its heart in the right place but not its language of communication!